The Hello GoodBye Show is an upbeat, eclectic live music show hosted by deXter Bentley every Saturday lunchtime between midday and 1.30pm on London’s only dedicated art’s radio station, Resonance 104.4 FM. Coming in to perform live in session on Saturday the 24th March 2018; the original Mod Housewife and perfect pop-rocker from across the pond Amy Rigby, tropical cosmic jazzateers Dubi Dolczek and instrumental Hammond Organ experimentalists Montague Armstrong. 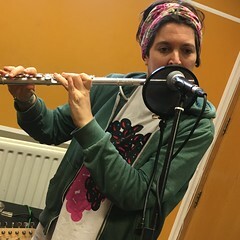 This entry was posted in dexter bentley, hello goodbye show, Hello GoodBye Show: Listings Info, resonance fm and tagged amy rigby, dexter bentley, dubi dolczek, hello goodbye show, london, montague armstrong, radio, resonance fm. Bookmark the permalink.